I’ll take any excuse to make something bread-y that I can dunk into a smooth velvety hummus. 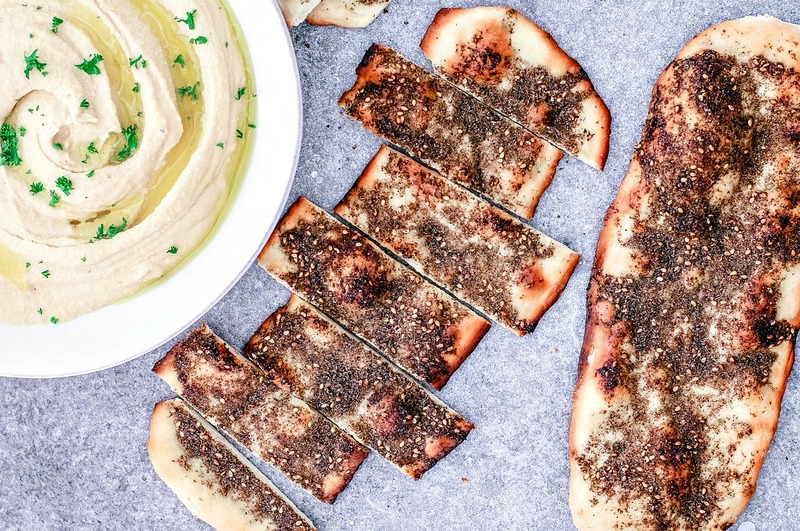 I’ll also take any excuse to smother za’atar and olive oil over flatbread. As you can see, today was a good day—because I made za’atar flatbread! Which is better known as man’oushe. When I read that za’atar was projected to be one of the big trending foods in 2018, I squee’d. I was first introduced to za’atar while researching homemade hummus recipes about two years ago—so it’s pretty new to me, too. I was able to snag some za’atar from the market and was pretty blown away by the earthy, citrusy, nutty, and herbaceous flavor. It’s a hard one to describe, but it’s a brilliant mix. Of course, there are plenty of varieties out there. The za’atar I used was a blend of thyme, sesame seed, sea salt, and sumac. If you’ve successfully made bread before, you’ll be fine with this. Making dough from scratch always terrifies me, especially since I’ve been having some serious issues with yeast lately. Buuuut, I make it anyway. (Though I’d love to chat to some regular bread bakers, if there are any reading this, about what might be happening.) My doughs just don’t want to rise or bubble lately. I still somehow manage to get my doughs formed in a fit of frustration and I make things happen, but something’s up. Send help. The steps here are pretty simple. Sprinkle yeast over warm water, add some sugar, and let it sit for about 10 minutes until it bubbles. Swirl in some olive oil, flour, salt, and stir the content until they become cohesive and too sturdy to stir. Then, carefully turn the dough over onto a flat lightly floured surface, and knead it for about five minutes, or until you’ve got a smooth ball of dough. Place the dough inside of a large bowl, cover it with a kitchen towel, and let it sit in a warm place to rise for about 1.5 hours or until it doubles in size. With a rolling pin, roll each hunk of dough into a flat oval shape; roll it out just until each piece starts to resist and pull back. When this happens, set aside and move onto the next. When you’re ready to pop these bad boys into the oven, give them one more turn under the rolling pin to flatten and spread them out nicely—try to get them to be 12 inches long and about 4 inches wide. Slather them with your za’atar and olive oil mixture, and bake them until they’re bubbling and golden, about seven minutes. You’ll see in the recipe instructions that a baking them on a pre-heated pizza stone is preferable. Mix the extra-virgin olive oil and za'atar together in a small bowl. Set aside. If, when slathering the dough, you feel you need more oil, go ahead and add a bit more. Add lukewarm water to a large bowl. Sprinkle the yeast over the water, then the sugar. Set in a warm spot and let it sit for 10 minutes, or until the yeast starts to bubble. Once your yeast is bubbling, add the olive oil, flour, and salt to the mixture. Stir with a spatula to combine until the mixture is cohesive and too sturdy to stir any longer. Carefully transfer the dough to a flat and lightly floured surface. Knead the dough until a smooth ball is formed—about 3-5 minutes. The dough should be a little sticky to touch. Place the dough ball into a bowl and cover with a dry dish towel. Place the bowl in a warm spot and let the dough rise for about 1.5-2 hours, or until it has double in size. Once the dough has risen, bring an oven rack to the upper mid part of the oven (in most ovens, this will be the second insert). Set a pizza stone on the rack. If you don't have a pizza stone, simply line two baking sheets with parchment paper and set them aside. If you're using a pizza stone, you'll want to preheat it in the oven for 30 minutes; baking sheets don't need this treatment. Transfer the dough to a flat and lightly floured surface again; divide the dough into six pieces. With a rolling pin, roll each section into an oval, just until the dough resists and pulls back. When this happens, set that piece aside and move on to the next. Repeat this for all sections of dough. When the oven is ready, take a section of dough and roll it once more bringing it to about 12 inches long and 4 inches wide. To prevent sticking, you can add a bit more flour to your flat surface or rolling pin; flip the dough over a few times to make sure it isn't sticking. Slather the dough with a layer of the za’atar mixture, about 1.5 TBSP per oval, leaving about 1/2 an inch of empty space around the edges so you have a crust. Carefully transfer the dough to the pizza stone, or baking sheet lined with parchment if using going that route. Repeat with the other dough sections and bake until the crust is golden brown, about 7 minutes. I was able to fit two flatbreads on my pizza stone at a time, so I baked them in pairs. Once the flatbreads are golden and bubbling, remove them from the oven. If you're using a pizza stone, you'll want to use a pizza scraper. Serve warm with your choice of topping and dips. Because I don't have a pizza peel, I placed my ready-to-cook flatbreads onto parchment segments I'd cut out for each flatbread individually, and placed them onto the pizza stone to prevent sticking and tearing since a metal spatula doesn't make any promises. I came here while searching for za'atar recipes, but I though I put in my little bit on what could be causing your dough probs. As long as your yeast is proofing, i.e., foaming, I can think of a few things that still might affect the bread. Too much sugar can make the yeast do all it's expanding too quickly, thus leaving you with not much oomph in your dough. Don't you love professional jargon? Likewise, salt retards yeast, and too much salt can slow down any yeast, much less one that has already done it's thing. Room temp could be an issue, too, as I'm sure you realize. So, assuming everything is a solid go on the yeast and dough, you still might have to allow longer for the dough to do it's thing. How's your hydration? Too little makes a dense dough that is hard for the yeast to expand. Too much and you'd probably notice because you'd be having trouble corralling the gooey mass. :) Don't know if any of this was helpful. Experiment with amounts of salt and sugar and so on. Last thought -- could your yeast be old. Just a little old and it will still proof but be weak. Try with fresh yeast, too.